This may be the perfect summer appetizer (or side dish, if you prefer). You can use whatever vegetables are in season and available and you can put them on the grill while it’s heating up for cooking your main course. 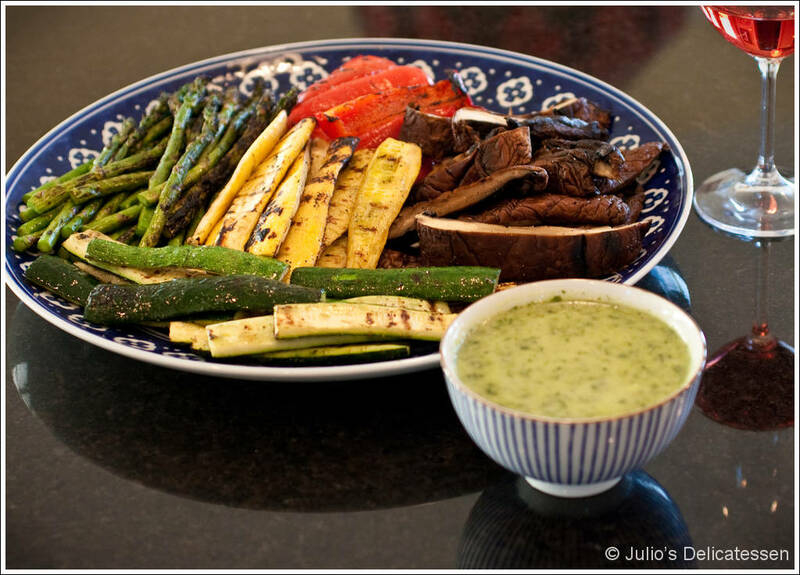 The green chile and cilantro in the vinaigrette work very well with the grilled vegetables, but would also make the dressing perfect for grilled salmon, pork, or chicken. Prepare vinaigrette – Add first 7 ingredients to a food processor. Pulse until well blended. Season with salt. Grill vegetables – If you need to work in batches, start with the mushrooms. Brush vegetables with olive oil and season with salt and pepper. Grill over direct heat, being careful not to overcook. If some items are done earlier, cover with foil while you wait on the rest. Serve immediately with the vinaigrette.